Charlene Newcomb is the author of Men of the Cross and For King and Country, two historical adventures set during the reign of King Richard I, the Lionheart, though her writing roots are in a galaxy far, far away. She has published 10 short stories in the Star Wars universe and written one contemporary novel. She is a member of the Historical Novel Society and a contributor and blog editor for English Historical Fiction Authors. Charlene lives, works, and writes in Kansas. She is an academic librarian by trade, a former U.S. Navy veteran, and has three grown children. When not working at the library, she is still surrounded by books and trying to fill her head with all things medieval. She loves to travel, and enjoys quiet places in the mountains or on rocky coasts. But even in Kansas she can let her imagination soar. Whoa! That's exactly the thought that crossed my mind when I finished the last page of Book Two in the Battle Scars series, For King and Country, by author Charlene Newcomb. This absolutely epic read is a fantastic piece of historical fiction and will keep readers engrossed from the very first words all the way through to the very end. Taking place in England in 1193, the story follows protagonist Henry de Grey, a knight who has just returned from the Crusades, and flies headlong into a battle that could very well change the course of history. But Henry also has a secret, and one he must keep hidden well. His relationship with Sir Stephan l’Aigle is absolutely prohibited, but their feelings for one another are real and strong. Will they continue to live with their secret, or die trying? You'll need to read this amazing book to find out! I loved For King and Country. Loved. It. Author Charlene Newcomb has done a simply fantastic job in creating characters that her readers will connect with, relate to, and care about, as well as continue to think of long after the final page has been read. If that isn't a hallmark of a great author, I'm not sure what is. Her research is evident in this tale, and her descriptive work is so detailed that readers will feel as if they can simply slip through the pages to the battlefields of 1193 England. The relationship aspect of the story is unique in a work of historical fiction, and the difficulties that Henry and Stephan encounter are truly heart wrenching. 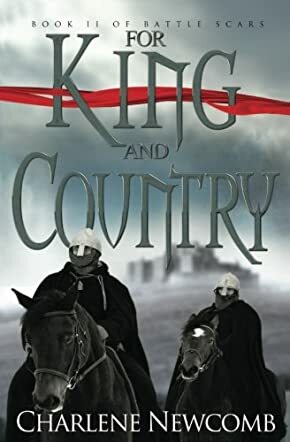 I highly recommend For King and Country, and very much look forward to reading more from the incredibly promising author, Charlene Newcomb, as soon as I possibly can! In a wonderful new work in the genre of historical fiction, For King and Country, the second book in the Battle Scars series, author Charlene Newcomb has given her readers a tale that they won't soon forget. Battle-weary knight Henry de Grey has returned to 1193 England after fighting in the harrowing Crusades. His country is at war, King Richard remains a captive of the Holy Roman Emperor, and Henry must fight side by side with Sir Stephan and Sir Robin, to protect all they have ever known and hold dear. But Henry's feelings for Sir Stephan must stay an absolute secret, even though their relationship holds an importance that neither of them can deny. This unique tale of love and war in a historical setting is incredibly readable, and this is a book that readers won't want to put down until the end. I very much enjoyed For King and Country. This is an extremely well written piece of historical fiction that is clearly well researched. Author Charlene Newcomb has a gift with character creation as well as descriptions of surroundings and scenes, and readers will often times find themselves on the edge of their seats as they are poring over this book. Historical fiction lovers, this is a book for you, but any reader looking for a great piece of fiction in general should also give this book a chance. It is easy to give this book my highest recommendation, and I will be keeping an eye out for the next book in this series. Author Charlene Newcomb, I hope you write quickly! For King and Country by Charlene Newcomb is the second novel in the Battle Scars series. The story of Henry de Grey and Stephan l’Aigle continues in this new volume. Things are taking a dangerous turn in the lives of these knights. Since King Richard is in captivity, the traitors are out for blood and gory enjoyment. Henry, Stephan, and their friends are tested beyond their limits against enemies and foes from the unknown. The dangers are too much for a mortal to survive. King Richard’s brother John is plotting to take the throne, and only Henry, Stephan and Robin are standing beside their king and their country. In the midst of all this, the feelings Henry has for Stephan are burning him up from the inside. He must keep his feelings for this man inside. He cannot afford a distraction in this scenario, especially with the enemy so close to their homeland. Can he do it? Yes, this is an amazing historical novel that will make you fall in love. Think Game of Thrones with a double dose of reality. This novel (and this series) is so real, you cannot help but imagine all the words being a real voice. I could almost make out Henry’s voice, picture his face, and see what he was seeing. This is writing at its best. I have been waiting for this sequel with baited breath, and I am so glad I got my hands on this novel. This is a through and through 5-star series.